David is demonstrating his kitchen skills. Mariya learns how to iron garments. Nicole chops a bell pepper in Home Economics class. 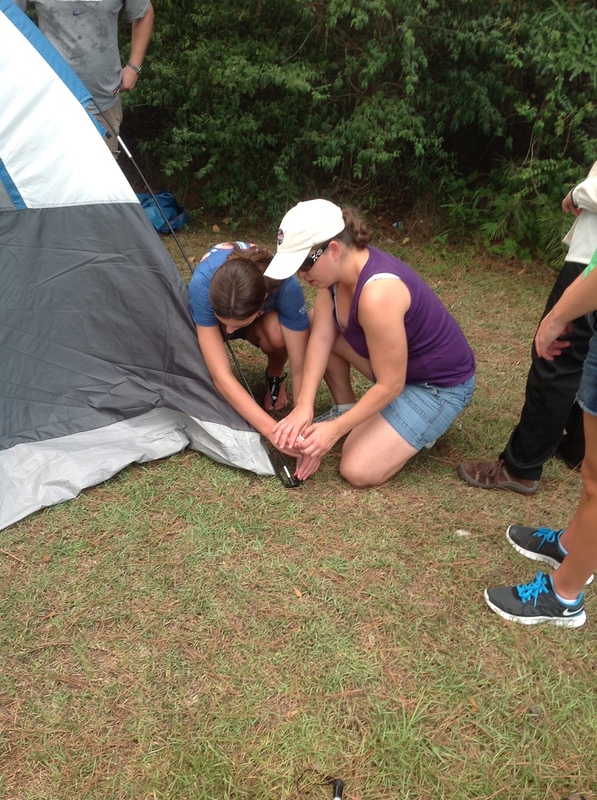 Counselor and student drop the hammer on a tent stake. Ben (counselor) and Matthew ensure that the tent is secure. Stephen opens tent to start the camping fun. Mariya (STEP student) and Danielle (Counselor) climb the rock wall at the LaTech Gym. 2012 STEP students tackle an indoor rock wall. Nicole answers phones as part of her summer work experience. Mr. G talks with Nicole and Ms. Zena about summer work progress. STEP 2012 bowling fun at LA Tech's Lambright gym. Stephen listens to hear how many pins he knocked down while bowling. Blake sings at the 2013 talent show. Bryant rings his freedom bell at the 2013 graduation ceremony. Kendal and Nikki model their 2012 STEP Program shirts during the talent show. Chris grills up a grilled cheese. Yum! Chris rings his freedom bell at the 2013 STEP graduation ceremony. Harley performs "Mad World" at the 2013 talent show. Harley rings his freedom bell at the 2013 STEP graduation. Jayla rings her freedom bell at the 2013 STEP graduation. Jayla prepares the desert for her meal for 16. Scrumptious! Kortnee stirs things up in home ec! Kortnee reads a poem she authored from her BrailleNote at the 2013 talent show. Merlyn rings her freedom bell at the 2013 STEP graduation. Merlyn whips up something yummy in the kitchen. Roman prepares the pumpkin pie for his Thanksgiving feast for 16! Sophie demonstrates how to control an iPhone using her BrailleNote. Sophie poses for a picture with her summer work colleagues. Great camaraderie! Cane travel instructor Mr. Ben gives students a travel route. 2013 STEP students and staff enjoy food and fellowship at the Dawg House Sports Grill! 2013 STEP students chill and talk at a campsite. 2013 STEP students roast hot dogs over a fire pit. Sophie demonstrates syncing her BrailleNote with her iPhone. Blake completes a route in travel class. This fowl was prepared by a STEP student for a meal for 16. Chris demonstrates proper cane technique on the stairs. Sophie and her parents talk with LCB's very own Susan Clark. Our Executive Director, Pam Allen, addresses the 2013 STEP students and their families. 2013 STEP students perform "Long White Cane" which was written by Sophie. Jayla recites "Ain't NoBody Got Time for That" 2013 STEP style at the talent show. 2013 STEP students pose for a group picture. Mr. G DJs at the 2013 talent show. Since 1985, the Louisiana Center for the Blind has been changing what it means to be blind for adults from across America. In 1990, a program was created to address the needs of blind high school students. The Summer Transition and Empowerment Program (STEP) is designed to introduce blind teenagers to positive blind role models and to provide them with the knowledge, skills, and attitudes necessary for living the lives they want. Students engage in interconnected activities designed to foster confidence through vital skills acquisition. Classes in Braille, Cane Travel, Technology Literacy, and Home Management are taught by qualified blind instructors. In addition, seminars will be conducted in the areas of workplace readiness (including social interaction, self-advocacy, and other critical “soft skills”), job interviewing Dos and Don’ts, resume writing, and employee rights and responsibilities. The second phase of STEP will continue all aspects of training and expand to include an employment dimension. Students will have the opportunity to participate in 40 hours of internship experience--for which they will receive the Federal minimum wage. They will be introduced to a broad spectrum of career possibilities as they explore postsecondary options including guidance with regard to applying for and beginning their higher education journey. The combination of workplace readiness activities, internship experience, and blindness skills--along with fun-filled activities such as cookouts, swimming, community service projects, mall excursions, and various other outings--will cultivate and strengthen self-confidence and independence in blind teens and better equip them for life now and after high school. From July 7-12, students will attend the national convention of the National Federation of the Blind in Las Vegas, Nevada. This exciting conference will allow them to meet thousands of competent blind people from across the country including educators and career mentors. The students will also have the chance to participate in a wide variety of informative seminars and youth-oriented social and life skills activities. August 9 and 10, parents will be REQUIRED to attend a Parents’ Weekend which will enable them to discover how much their children have learned throughout the summer. STEP is designed to provide invaluable internship experience, friendships, opportunities for personal growth, and cherished memories. Training will begin June 16 and conclude August 10. We recognize that there may be some overlap between the start and/or conclusion of our program and school district dates. If accepted, we are happy to coordinate with a student’s school district in this regard. Due to limited space, we cannot guarantee that every applicant will be granted enrollment, and applicants must have an open case with their state’s vocational rehabilitation agency or other funding entity to cover program costs. Questions? Please call our Director of Youth Services, Eric Guillory at 800-234-4166. You may complete an application. "Together, we are changing what it means to be blind." Check out STEP and find out how.